Is it tacky to throw yourself a party? I hope not, because that is totally what I am doing today. Pointy hats and sugary treats all around! Before there was SugarHero there was a shamefully neglected blog called Cake or Death, which was hilarious to the three or four other Eddie Izzard fans who stumbled upon my blog. Fellow British comedy lovers, holla! Cake or Death introduced me to the world of food blogging, and I made good friends during my time there, thanks mostly to my participation in the Tuesdays with Dorie baking group. Over the years I learned a lot about good blogging practices, and the etiquette of recipe adaptation, and how to take appetizing food photos. I also learned about the limitations of free blogging platforms, and I learned that I could be a very negligent blogger indeed. By the middle of last year, I was totally over my old blog—I hated the design, I hated that I didn’t know how to customize anything, and I hated that it just didn’t feel like me. I was so over it I declared it dead and stopped blogging completely. So, several months, many frantic googling sessions, dozens of angry hair-pulling episodes, and one epic web design later, SugarHero was launched! It’s just about the me-ist place I can imagine. It’s colorful (the less generous among us might say garish) and playful and happy and full of dumb jokes and awkward prose and big pictures and totally unhealthy desserts. 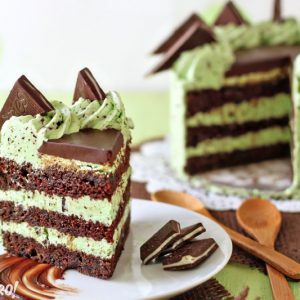 To celebrate SugarHero’s one-year anniversary, I did another me thing, and made a completely torturous dessert that looks awesome, tastes great, and is an absolute pain to make. It’s good to know some things never change! on how to make them, for crying out loud. 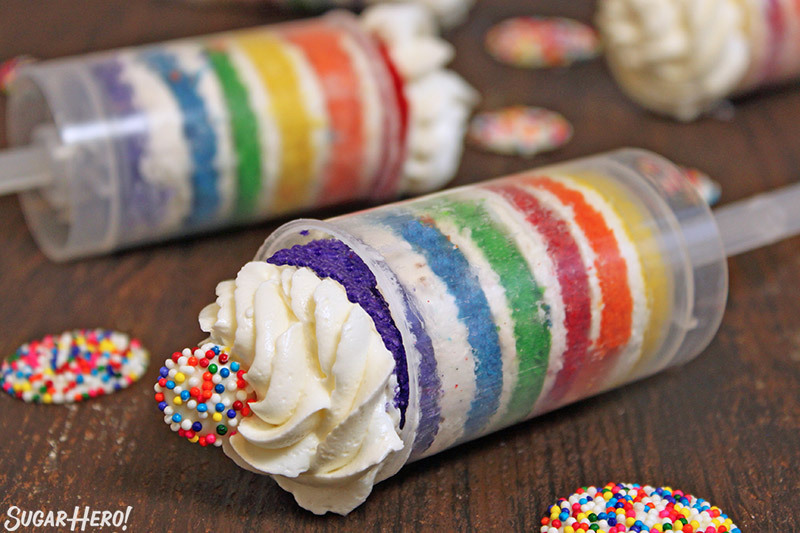 I wanted to make something fun and whimsical and unusual for the ole blog birthday, so I combined the idea of cake push-up pops with the spectacular rainbow cake I’ve seen around, specifically on Sweetapolita and Whisk Kid. If I may toot my own horn, the pops turned out pretty darn cute. 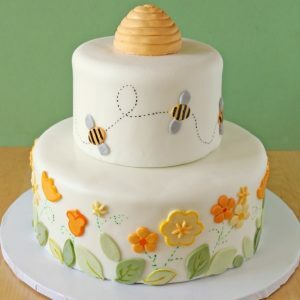 They’re visually striking, and they have the classic birthday cake flavor combination of butter cake and vanilla frosting. I have to be honest, though, and say that these were a ton of work. They are not something to be undertaken lightly. So many layers! So much food coloring! So very, very many cake rounds to cut and assemble! I’m not saying it wasn’t worth it—because nothing is too good for a blog’s first birthday party!—but I am saying that I’m not responsible for sleepless nights caused by this fiddly recipe. Anyhow, here’s to a fantastic year of SugarHero-ing. Here’s to frivolous desserts and insensible diets and sugar highs and more butter than you can shake a stick at. Here’s to old and new blogging friends, to you weirdos who send me pictures of your crystal meth candy [I love you I love you I love you] and to all of you who’ve left nice comments or sent lovely emails. Here’s to you, and here’s to another sweet year. 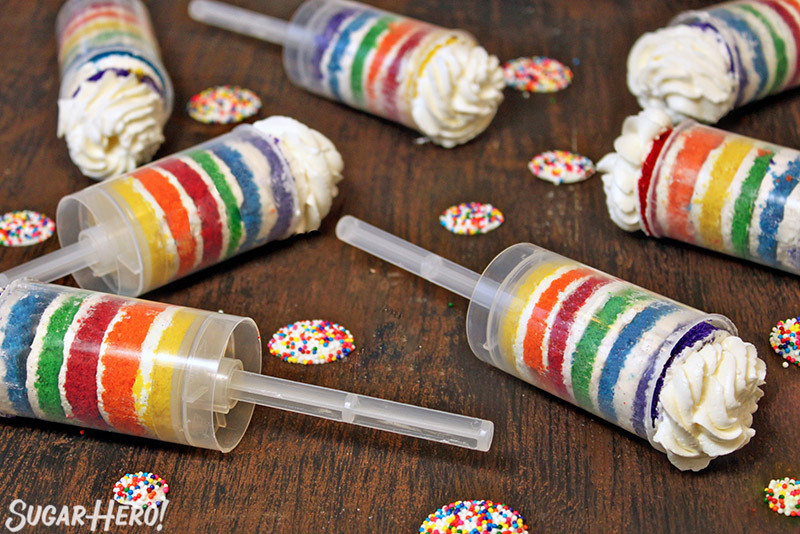 These Rainbow Cake Push-Up Pops are something fun and whimsical and a bit unusual but they still have that perfect birthday cake flavor combo of butter cake and vanilla frosting. These are both just fun and delicious. Line as many 9x13 pans as you have with parchment, and spray with nonstick cooking spray. (I actually used 9” round cake pans, but I ended up having to split the cakes in half so all 6 colors would fit in the pops. Splitting the thin cakes was tricky, and I think just making one ultra-thin layer of each color in a 9x13 would be easier.) Preheat your oven to 350 degrees Fahrenheit. In a small bowl, combine the flour, baking powder, and salt, and sift together. Place the butter and the granulated sugar in the bowl of a mixer and cream on medium-high until light and fluffy. Add the egg whites one at a time, beating well after each addition. Add the vanilla extract and mix it in. With the mixer on low speed, add a third of the flour. Once it’s almost all incorporated, add half of the milk, then when that’s mixed in, add half of the remaining flour. Add the last of the milk, and once that’s gone, add the rest of the flour. Stop the mixer when it’s almost entirely mixed in, and do the rest by hand with a spatula, scraping the bottom and sides of the bowl to make sure everything’s incorporated. Divide the batter into 6 even portions (this is easiest to do with a kitchen scale—weigh the total amount of batter, then divide by 6). Add enough gel food coloring to each portion to make a vibrant color—don’t be skimpy! Pour the batter into the prepared pan(s) and bake until set in the middle, about 10 minutes. (It will be closer to 15 if you are using 9” rounds instead.) Let them cool for 10 minutes, then flip them out and let them cool completely. If you need to re-use the pans to bake off more colors, wash the pans and parchment/spray them, then repeat the process until all of your cake layers have been baked. Combine the egg white and sugar in the metal bowl of a stand mixer. Bring an inch of water to a simmer in a saucepan that fits snugly on the bottom of your mixing bowl. Make sure that your water level is low enough that when you place the mixing bowl on top of the saucepan, the water doesn’t touch the bottom of the pan. Whisk the egg whites/sugar over the simmering water bath until the whites are hot and the mixture has started to increase in volume and turn opaque. When you rub the egg whites between your fingers, the sugar should be completely dissolved and should not feel gritty at all. Transfer the mixing bowl to the stand mixer and beat with a whisk attachment on medium-high speed until the whites are voluminous, shiny, and smooth. Beat them until they are not warm at all. Add the soft but slightly cool butter to the whites a tablespoon at a time. As you continue to add the butter, the whites will deflate, and might even look curdled or broken. Don't worry! As long as you waited until the whites were cool, everything is fine. After all of the butter has been added, increase the mixer speed and beat for a few minutes, until the frosting smoothes out and comes together. Add the pinch of salt and vanilla extract and mix well. If for some reason it remains curdled, refrigerate the bowl for about 10 minutes, then beat on medium-high speed until it comes together. Once firm, use a round cutter slightly smaller in circumference than the push-up containers to cut 24 circles out of each color of cake/frosting. If you don’t have a cutter the right size, you can use the bottom plunger to cut out circles. It’s not as sharp as a metal cutter, so the cuts won’t be as clean, but it will still work. If the frosting has softened during the cutting stage, return the cakes to the refrigerator or freezer until it is firm again. Now begin assembly. Push the plunger up to the top of the container, and lay a cake/frosting round in it. Lower it slightly, and put a different color on top. Continue to lower the plunger and add cake layers until all six colors have been added. Push down to compact the layers and meld them together, if necessary. After all of the pops are assembled, take the remaining buttercream and pipe a swirl on top of each one. Variations: If you don’t care about perfectly smooth, even frosting rounds, assembly will go MUCH faster! 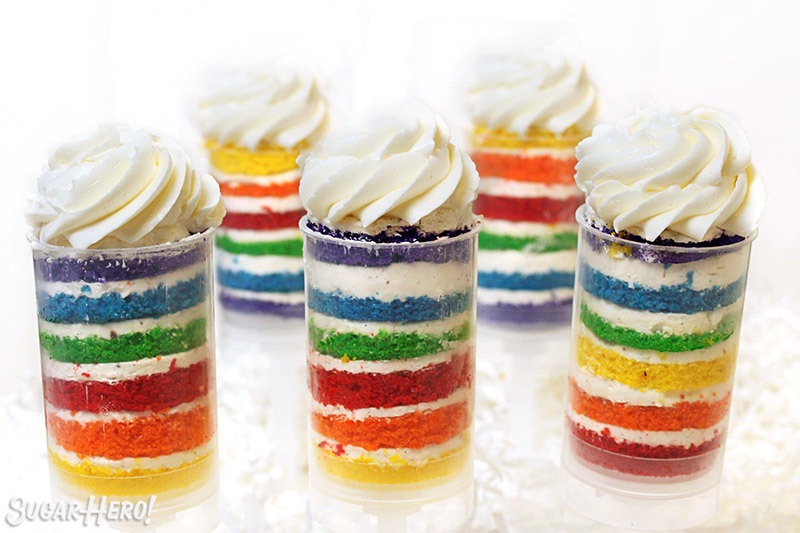 Simply cut out cake rounds, and as you layer them in the container, use a piping bag to swirl a bit of frosting on top. It might be less even, but you won’t have to worry about keeping the cake chilled in order to be able to manhandle the frosting. Another timesaver is to only do a few colors per pop, instead of trying to squeeze in all six. If you do this, you can bake the cakes in 9” rounds and not have to worry about splitting the layers. 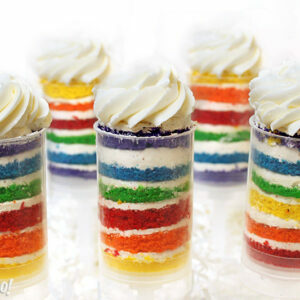 Use only three colors per pop, with two frosting layers—this will also greatly reduce the amount of frosting you need. Win-win! 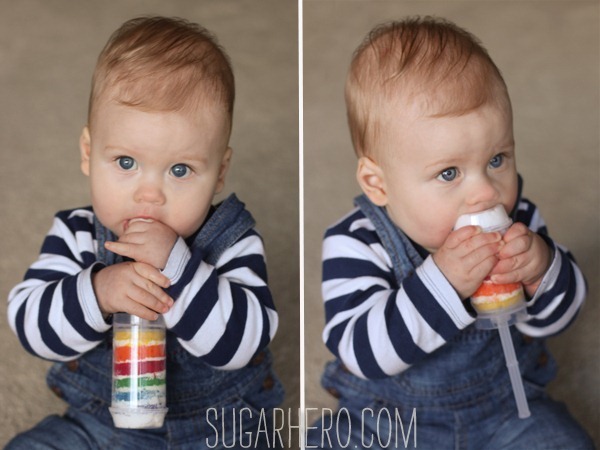 I’m hoping for many more sweet years of SugarHero! And not just to satisfy my sweet tooth either. Another great blog post by the best wife in the world. P.S. – I’ll get right on that tombstone design. Happy anniversary–I’m a big fan! It makes so much sense that you too like Eddie Izzard. Pretty sure I made a “cunning use of flags” reference at some point on my blog, haha. Cheers friend! Of COURSE you like Eddie Izzard too! Get out of my head! 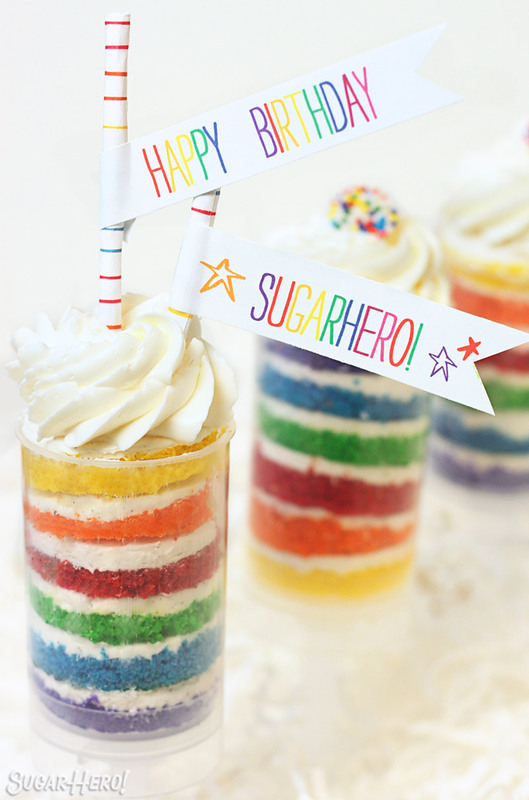 Happy Birthday Sugarhero! And many happy returns. 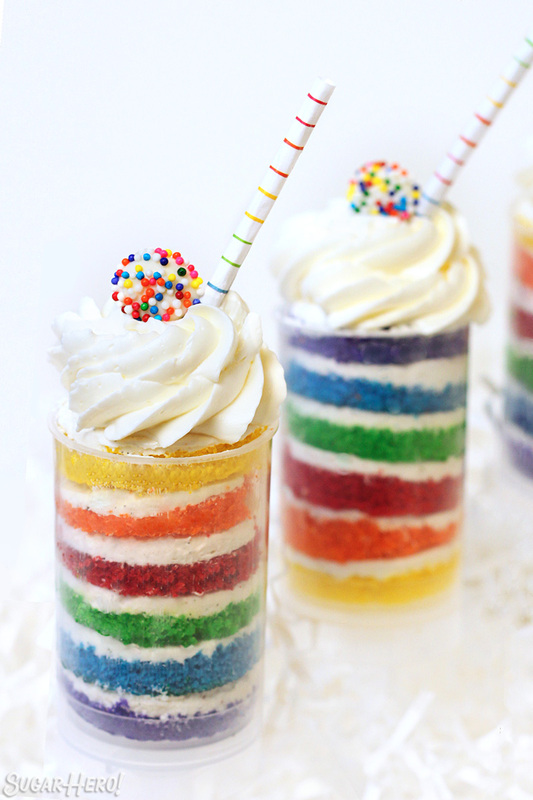 Thanks for the recipe and the adaptation from Whisk Kid’s rainbow cake. I made these for my daughter’s class in celebration for her 8th birthday. I really appreciate that you went with home made cake and swiss meringue buttercream since there are other sites that use box mixes and ready made frosting. These are not difficult but take time. 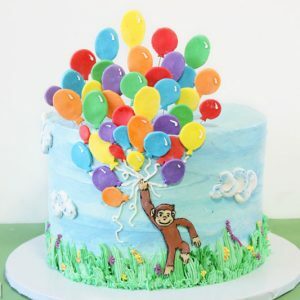 One tip is to pipe frosting in the center of the cake and let the next cake layer squeeze the frosting to the sides, less mess and much quicker. They were a huge hit with the class! I love these! 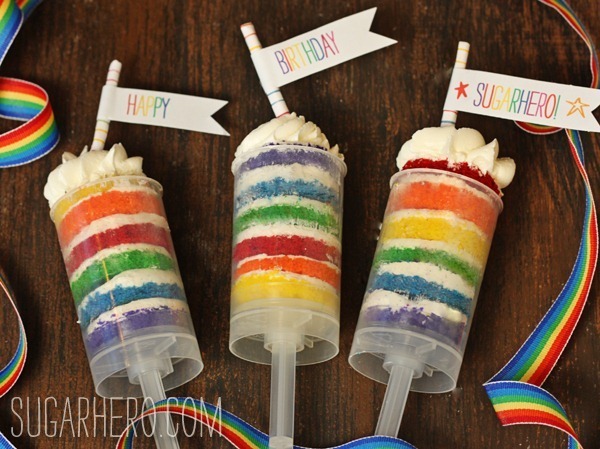 Can’t wait to make them for my son’s first birthday. Question – where did you get those little nonpareil disks for the toppers? How far in advance can I make these? My daughters birthday is Saturday but my only day off is Wednesday. I would say you can make the cake and buttercream on Weds and keep the layers in the freezer (well-wrapped in cling wrap) but I wouldn’t assemble them that far in advance. I think the cake would start to dry out if they were assembled that early. Okay. I i’ll do that. Thank you!